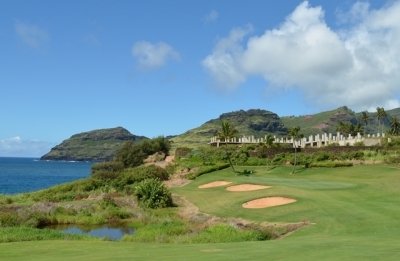 LIHUE, KAUAI, HI – When planning a trip to Hawaii, you’re probably thinking you’re not going there solely to play golf. But once you reach the islands and see golf courses like you’ve never experienced before, you might just change your mind. 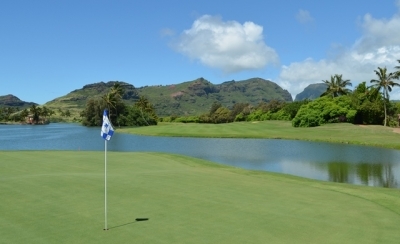 One case in point is the Jack Nicklaus designed Ocean Course at Hokuala, which is a mere stone’s throw from the runway of Lihue airport on the Garden Island of Kauai – yet offers just about everything you’d ask from golf in the Aloha State. The views on the ocean holes are unbelievable, with the deep blue of the Pacific below and the lush green tropical mountains in the distance. 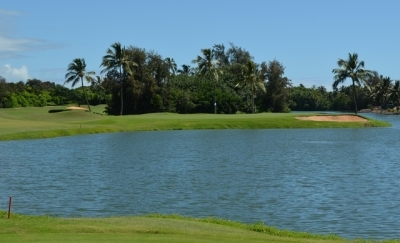 According to the Hokuala website, the back nine offers Hawaii’s longest continuous stretch of oceanfront holes. 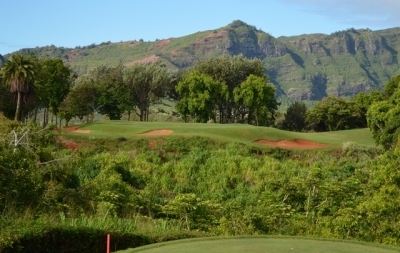 Comprised of holes 13-16 (or 4-7), you play alongside pounding surf and over jagged lava outcroppings, referencing Kauai’s distant volcanic past. The formerly 36-hole complex first opened in the 80’s and has subsequently been renovated several times, the most recent being 2011. The 2011 changes included installing TifEagle greens that roll faster and are less grainy compared to the previous greens. 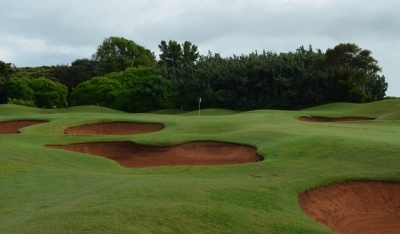 Also, the red sand bunkers were rebuilt and replaced with white silica sand. 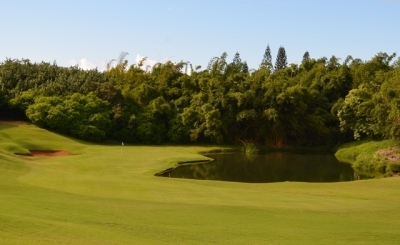 The golf course itself contains some really difficult holes as well as a number that are more resort friendly. Garner says it’s a Nicklaus philosophy to incorporate enough challenge for good players while also providing an enjoyable experience for average players. He’s certainly done that at Hokuala, though average players will still likely struggle on a couple of the harder links. It’s not your typical resort golf course where there’s a mile in every direction to drive the ball and the greens are flat and easy. Far from it, in fact. 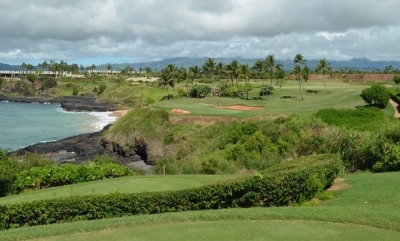 The Ocean Course at Hokuala was formerly known as Kauai Lagoons Golf Club, owned and operated by Marriott resorts. I have not been back since the course came under new management. One of the unique aspects of Kauai Lagoons is its statues. 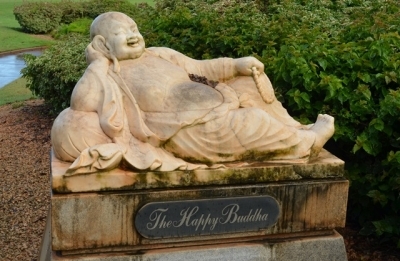 There are not as many as there once were, apparently, but you can still greet Buddha before you reach the first tee. 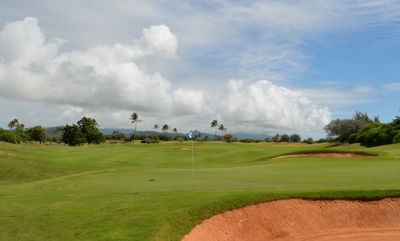 The 436-yard, par four 3rd is the number one handicap hole on the Kiele Mauka nine. These bunkers help demonstrate why. At 219 yards from the back tee, the par three 5th hole is as intimidating as it is challenging. The view from the tee of the risk-reward par five sixth hole. Depending on the wind, that is a heck of a carry. The par three 8th is the shortest hole on the Kiele Mauka nine, but with water and sand guarding the green, it is no pushover. 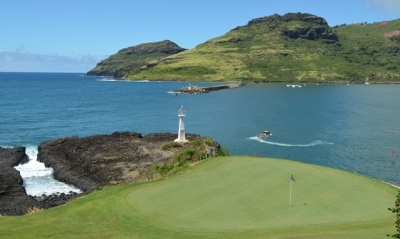 The short par four 12th hole is right near the Lihue airport runway, but there is no distracting from its beauty. Moving towards the ocean on the long but wide par four 13th hole. 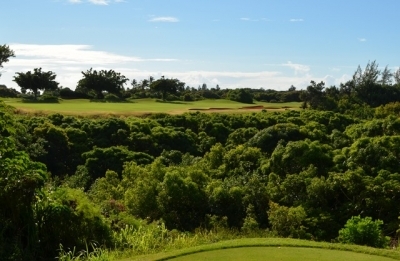 Golf holes like the par three 14th are what you came to Hawaii for, right? Tee shot placement is crucial on the par four 15th hole. The ocean view is pretty cool, too. 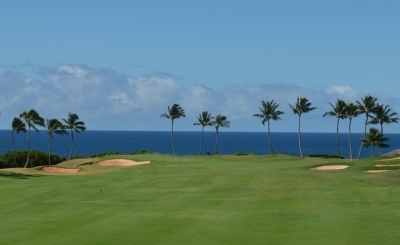 The short par four 16th hole would be considered quirky in most settings -- but not at Kauai Lagoons! Moving away from the ocean, you head into the wind and still have to hit over a lot of water. Here, the par three 17th hole. Looking back at the par four 18th hole. The view is something you will not forget. Check the website for the latest rates and specials. It's always a good bet to check the website for updated rates and specials.